Why has Google bought Nest? If you hate the phrase the Internet of Things, then you are not alone. Tony Fadell, founder of Nest, isn't a fan either. He told TechRadar back in November that items that should never be 'connected' include fridges, toasters and kettles. And this is from the guy who made both smoke alarms and thermostats 'smart'. According to recent news, he has every right to be picky. His company Nest now belongs to Google – the web giant acquired it this week for a whopping $3.2 billion. But what does Google want with Nest? The answer is simple: Google just bought itself a first-class ticket into your home, something it has unsuccessfully been trying to do for years. Google has been gearing up for this moment since 2009, when it launched its web energy management tool PowerMeter. The idea was ahead of its time. PowerMeter essentially enabled its users to monitor and also manage the energy they consumed online through an iGoogle widget (yup, remember iGoogle?). The problem was that Google couldn't convince the world that energy consumption was data that needed tracking. Oh, and it also couldn't convince the energy companies to buy into the service either so closed it down in 2011. By buying Nest it just solved both of those problems. And then there's the Android@Home initiative. At its I/O developer conference in 2011, Vic Gundotra talked about how the perfect home was one that was run in part by Android. The centrpiece to this presentation was a strang black orb – a prototype that ended up being the much maligned Google Nexus Q. The eventual product was officially shown off at Google I/O 2012. The idea was that the Nexus Q was to be a social media player, one that would connect to both your living room's television and speakers. It would connect up the home entertainment parts of your home like no other product since could. Much to Google's disappointment, it didn't connect with audiences at all and now lives only in the homes of Google I/O attendees (who all got one for free) and those who pre-ordered it – who also eventually got the device for free. Since the Nexus Q, Google's plans to dominate the home has, well, stuttered. At the same time the home automation market has started to show its true worth, with a trickle of stand out products taking advantage of the connected home idea – one being Philips Hue lighting system and the other being Nest's thermostats and smoke alarms. The Nexus Q - Google's biggest balls up? Until its buyout of Nest, Google has only been on the cusp of the home. 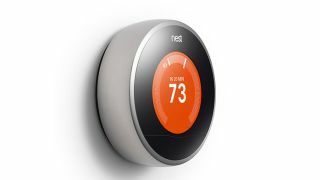 Its Android system is being used sporadically in refridgerators and the like – typically the products that Tony Fadell believes shouldn't be connected – but with Nest, Google has hit the home automation sweet spot. In a way, Nest's relationship with Google has come full circle. Google Ventures was at the front with its wallet out when Nest went through a new round of funding this time a year ago. And now it is paying for a company it helped fund more than double what it paid for YouTube in 2006. But what is it actually getting? Well, unlike YouTube, it is buying a product and service that doesn't need fixing. The day Google bought YouTube was the day Google's lawyers let out a deep, synchronised sigh. It was a service mired in copyright clashes that needed fixing fast. With Nest, Google has picked up two products that are universally praised by reviewers and the people that use them. Nest Protect is a smoke and carbon monoxide alarm that gives you peace of mind even when you are away from your home.